Chapter 2 of Deep Magic: 13th Age Compatible Edition describes 30 specialty schools and magical traditions, each with flavor text to give you an idea of how the school fits into the world, a brief description of how they like to use their spells, and a list of their spells. Here are some of our favorites: The Daughters of Freyja, The Forlorn Elementalists, The Inklings, The Red Inquisition and the Zobeck School for Scoundrels. Any listed spell with an asterisk (*) next to it indicates that it is your “go-to” spell: a 1st level at-will attack spell or equivalent. Some schools of magic teach a particular feat with a spell, but if you choose that feat, it has to be taken normally per the 13th Age rules — it doesn’t come free. The Daughters of Freyja claim that their tradition was founded by the goddess of beauty herself, taught to her mortal offspring to protect them in a harsh and often ugly world. The Daughters maintain a tower somewhere in the far north, far from the eyes of most mortals. Despite their name, the Daughters of Freya contain a number of men, and even some living constructs. Finbrule’s Fabulous Follicles— With the adventurer feat variant princess’ tresses. The city of Tintager stands on the site of the last surviving Feyward, ancient human watch posts marking the border between the old magocracies along the Leukos River and shadowy Arbonesse to the west. Holding the line against elven aggression and safeguarding Allain’s sovereignty, the city of iron towers stands tall and proud. Justice in Tintager is as harsh as the spell-blasted landscape that surrounds the city. Criminals exiled to Tanager’s Trial Tower by the city’s Feywardens, and who manage to survive and reach the exit, are given a pardon; but few make it out alive. It is an open secret that some are offered the chance to join the Forlorn Elementalists, an elite group of casters bound by magical oaths to the service of the Feywardens. Most Forlorn Elementalists die during their basic training. Those that don’t will probably die in their first fight. The Forlorn Elementalists are deployed ahead of other forces, dispensable shock troops sent on suicide missions. The rare few that make it through their year of service are free to go where they will, with the blessings of the Feywardens. Decide if you served your time in the Forlorn Elementalists, or if you somehow escaped your magical bonds and fled Tintager. If you are a veteran then you start play with battered armor, or a uniform that marks you as such. If you are a deserter then you probably got rid of any identifying clothing as quickly as you could. Either way, you have a leather-and-chain undershirt (light armor) that saved your life more than once, a dagger that has seen battle, and a pair of sturdy boots. Composed of scholars and practitioners of forbidden ink magic, this secretive group meets in rooms above taverns and in private homes to compare notes. The inner circle of the group postulate the existence of an ink-based realm of pure thought, but a breakaway group known as the Cult of Ink have recently started worshiping what they supposed to be a squid god. Surprisingly, the two groups are still on good terms and meet regularly to drink together. As an Inkling you have someplace you call home, with a modest library. You also have a hidden room in your house. That’s where you keep your real library, the one the authorities would arrest you for if they knew about. You carry a sword-cane, because you don’t see why you can’t combine self-defense with style. Truth-finders for hire, the Red Inquisition are the people to turn to when you want a mystery solved, heretics uncovered, or a murderer found. They don’t much care who gets hurt, provided they get paid. The golden-masked and red-robed inquisitors can be found in most major cities, and they are always careful to obtain the permission of the local authorities before taking on any case. The Red Inquisition’s headquarters is a large estate in the republic of Trombei. Despite their fearsome reputation, even Red Inquisitors need to eat; and most of their cases involve mundane matters such as uncovering marital infidelity, conducting background investigations, and tracking down missing persons. As an inquisitor you have a red robe and golden mask (actually just gold painted wood), a scary looking dagger, a heavy iron-shod staff, and a satchel with torture implements. You also have everyday clothes for when you are under cover. When not in uniform you carry a dagger (hidden up each sleeve), and a shortsword in a hidden sheath down the back of your shirt. You carry a notebook and pencil, and probably have some form of official documentation for the city or region that you live in if questioned by guards. If you have parted ways with the Red Inquisition then you handed in your robe and mask when you left. Kobolds in the Free City of Zobeck are a downtrodden minority, confined to a single district, but some kobolds have set their sights higher. These adventurers are known for their resourcefulness, adaptability, and capacity for treachery and tomfoolery. 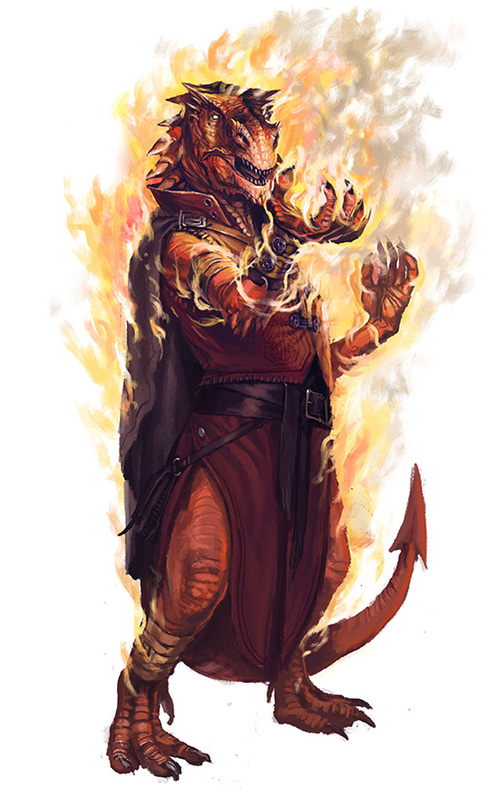 Few are as infamous as Illemak, an eccentric kobold wizard with a knack for creating spells that leverage trickery and surprise to give casters the upper hand in countless sticky situations. 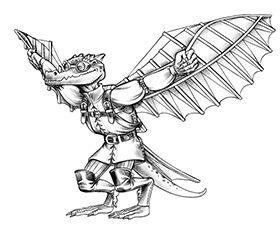 To aid him in robbing the rich and annoying the powerful, Illemak created the Scheming Scoundrels: an all-kobold band of talented misfits and wanderers. This group was behind a wave of unexplained thefts, vandalism, and various hijinks that plagued the ruling class during the band’s heyday. Sometimes the Scoundrels offered aid to imperiled Zobeckers with nowhere else to turn. Most of the Scheming Scoundrels are gone now, but a few surviving members have set up a school to teach their ways to a new generation. At least, they claim to have been members of the original Scheming Scoundrels. Who can say for sure? As a Scoundrel you have a hidden knife in a springloaded wrist sheath, a sword cane, a hat with a blade hidden in the brim (count as a throwing dagger), a copper chain undershirt (count as light armor), and a copy of the book The Rules of Gamesmansip and Lifemanship which purports to have been written by Illemak but almost definitely wasn’t. Detect Dragons— With the adventurer feat, which comes in handy in Zobeck. I own the Pathfinder version of Deep Magic and, having read this article, I wonder if the two versions are different enough ( especially as far as Setting content is concerned) that I should consider buying the 13th Age version as well. Can anyone comment on that?